Nobody will admit it now, at what is arguably the internet’s height of fickleness, but it hasn’t always been popularly-accepted knowledge that Bill Murray is the best. He’s a national treasure, a trove of quotability and a vault of anecdotes, an ever-changing meme in the form of a man, and it’s hard to find anyone who’d dissent even a little bit. Everyone’s all the way on the bandwagon today, but here’s a question” where were all of you in 1997? Because I was in the multiplex and I didn’t see none of y’all. Not even you, Wes Anderson. THE MAN WHO KNEW TOO LITTLE represents the third collaboration between Bill Murray and Howard Franklin, who was Bill Murray’s co-director on 1990’s QUICK CHANGE, who wrote and directed LARGER THAN LIFE (that’s the one where Bill Murray inherits an elephant and yes I also saw this one in the theater), and who co-wrote this film, which was directed by Jon Amiel. THE MAN WHO KNEW TOO LITTLE is what they call a ‘farce’, a send-up both of Hitchcock wrong-man thrillers and 1960s British spy romances. 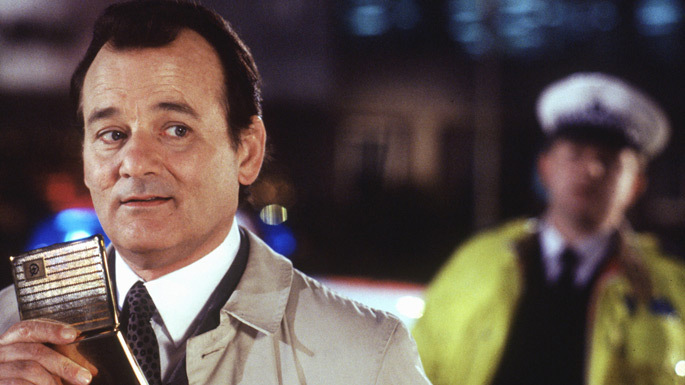 It’s a bit of an anomaly because by this point, Bill Murray had a well-worn comedic persona, the one we recognize in movies like MEATBALLS, STRIPES, TOOTSIE, GHOSTBUSTERS, SCROOGED, QUICK CHANGE, GROUNDHOG DAY, and MAD DOG & GLORY, the laconic and sardonic cynic with a romantic buried deep underneath. By this point, he wasn’t doing character roles like he had to do regularly on SNL and like he did so definitively in CADDYSHACK. You might see him do the occasional character in cameos and bit parts like he did in LITTLE SHOP OF HORRORS, ED WOOD or KINGPIN, but if you really think about it, his career is largely composed of virtuosic variations on the “Bill Murray” persona, and it’s fairly rare to see him stepping too far outside of that sphere. One notable exception is WHAT ABOUT BOB?, where he plays a lovable naïf, unintentionally troublesome, endearing to some and maddening to others. That’s largely what he’s doing here, although here he’s even more of an innocent and a bumbler. Quite frankly it isn’t a “Bill Murray” role at all — if you were the casting director on this movie, you could easier imagine anyone from Peter Sellers to Chris Farley doing the part before you’d think to call Bill Murray. Like LARGER THAN LIFE, it was a financial failure. Beyond the fact that the success of star-based comedy has plenty to do with recognizable personas, there had been a shift in the culture at the time. Both LARGER THAN LIFE and THE MAN WHO KNEW TOO LITTLE were throwbacks, sweet-natured comedies with affection for the films of earlier eras. The mid-to-late 199os were usurped by comedians like Adam Sandler and Jim Carrey, with styles that were rambunctious, rude, and somewhat deranged. Even Bill Murray’s de facto mode — laidback — wasn’t in vogue at the time. Hysteria was the mode of the moment. Not only was Bill Murray not playing his de facto mode; he was trying something new, mixing in a more obvious sweetness. I would bet if you went back to LARGER THAN LIFE and THE MAN WHO KNEW TOO LITTLE you would find them enjoyable, if a little bland, with a couple great jokes surrounded by a bunch of vanilla ones (by the way vanilla is delicious, don’t knock vanilla) but at the time of theatrical release, they were lost in the noise. This is possibly why Bill Murray made the shift to low-fi indie-type film soon thereafter; either that or it was fortuitous timing for everyone.